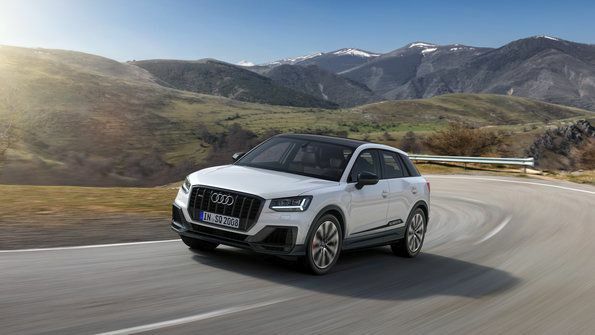 Striking design meets tremendously fun driving: Audi is presenting the SQ2 for the first time, the new top model of the Q2 family stands out in the compact SUV segment: It puts out 221 kW (300 hp), enough to sprint from 0 to 100 km/h (62.1 mph) in 4.8 seconds and a top speed of 250 km/h (155.3 mph). quattro all-wheel drive and the S sport suspension applies the power smoothly to the road. 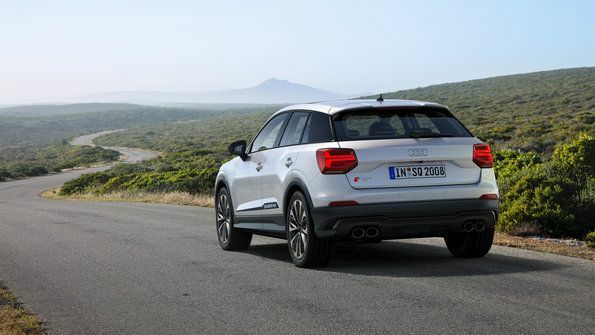 The Audi SQ2 is also at the head of its class with respect to operation, infotainment and assist systems. The heart of any Audi S model is the engine, and the 2.0 TFSI in the SQ2 (combined fuel consumption in l/100 km: 7.2 – 7.0*; combined CO2 emissions in g/km: 163 – 159*) is in peak form. It puts out 221 kW (300 hp) and a constant 400 Nm (295.0 lb-ft) of torque between 2,000 and 5,200 rpm. Developed by Audi engineers and built in Győr, the engine outclasses all its rivals in this segment. The same applies to the sport SUV’s performance: The sprint from 0 to 100 km/h (62.1 mph) takes 4.8 seconds, and top speed is a governed 250 km/h (155.3 mph). 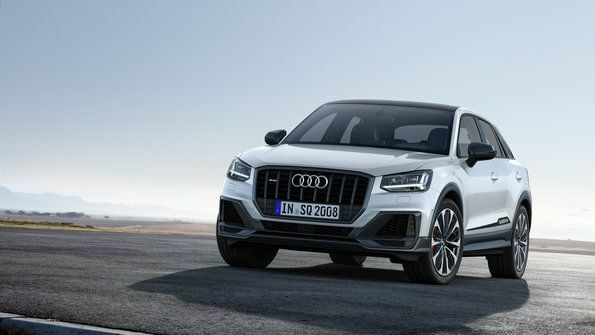 The four-cylinder TFSI in the Audi SQ2 is a high-performance, 1,984 cc engine. It responds instantly up to the redline at 6,500 rpm. In the dynamic mode of the Audi drive select dynamic handling system, it responds even more directly, with brief double-clutching accompanying the gear changes by the S tronic. The engine develops a particularly sonorous sound when driven dynamically. The 2.0 liter TFSI engine weighs only around 150 kilograms (330.7 lb), which benefits not just the total weight of the Audi SQ2, but also the axle load distribution. Numerous high-tech features hone the profile of the powerful four-cylinder. The intake and exhaust camshafts are adjustable to optimize fill and gas exchange. On the exhaust side, the Audi valvelift system (AVS) adjusts valve lift in two stages based on demand. This reduces flushing losses in the combustion chamber and ensures optimal flow of exhaust gas to the turbocharger, particularly in the low rpm range. The advantages of this are agile engine response and a further increase of torque. Controlled by a fast and precise electric overflow valve, the turbocharger develops its maximum boost of 1.4 bar (relative) very dynamically. This engine management system enhances efficiency and reduces fuel consumption during operation under part load. Efficiency is also a major focal point with the 2.0 TFSI. Two electric-powered rotary valves consolidated into a module regulate the coolant flows. Another major component of the thermal management system is the exhaust manifold integrated into the cylinder head. It helps the engine to warm up quickly. Targeted measures implemented in many components increase strength and reduce internal friction. The regulated oil pump requires little drive energy. Under part load, the engine management system deactivates FSI gasoline direct injection. Instead, fuel is injected indirectly into the intake manifold, which reduces particle emissions. A particle filter also cleans the exhaust gas. A seven-speed S tronic with a high spread of 8.7 between the first and last gears transfers the power of the 2.0 TFSI. The driver can operate the lightning-fast dual-clutch transmission in the automatic modes D or S, or shift themselves. 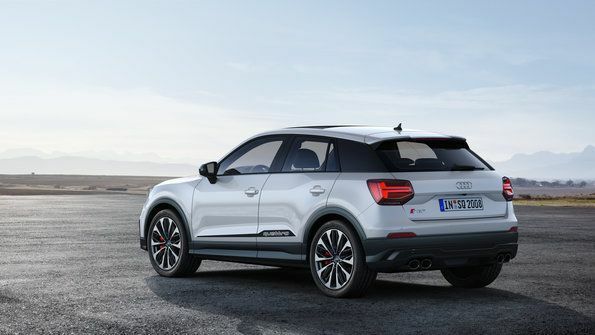 If the Audi drive select dynamic handling system is in “efficiency” mode, the clutch disengages when coasting, allowing the compact sport SUV to freewheel. From a residual speed of 7 km/h (4.3 mph), the engine already switches over to start-stop operation. As with every Audi S model, quattro all-wheel drive is standard in the SQ2. It combines high traction with fascinating handling. Its central element is a hydraulically actuated multi-plate clutch. It distributes torque continuously between the axles. If the front wheels lose grip, the multi-plate clutch can transfer up to 100 percent of the force to the rear within just a few milliseconds. The quattro drive’s electronic controller provides for the ultimate in driving enjoyment and safety. During sporty driving, it can direct torque to the rear axle as soon as the driver turns the wheel. Under acceleration, the torque literally pushes the fast SUV into the curve. The quattro management system enables precise turn-in during load reversal, and provides maximum control and reliability when drifting on a low-friction road surface. During fast driving, the quattro drive works closely together with the wheel-selective torque control, which smooths out the handling with tiny braking interventions at the inner wheels under reduced load. The S sport suspension in the Audi SQ2 harmonizes optimally with the dynamic powertrain. With a sportier setup than the system on which it is based, it lowers the body by 20 millimeters (0.8 in). The power boost of the standard progressive steering has an S-specific characteristic. Its rack is specially geared so that the steering ratio becomes more direct the further the wheel is turned. This reduces the steering angle needed and produces a sporty driving feel. Agility is improved when maneuvering, in urban traffic and in tight bends. The base Audi Q2 is already an SUV with a very distinctive character. The wedge-like architecture and precise body line, the flat cabin, the polygonal indentation on the flank and the blade on the C-pillar give it an unmistakable appearance. Audi has further honed the exterior design for the S model. The front end alone indicates the special position occupied by the vehicle. Eight upright double bars divide the large, octagonal Singleframe grille. A front splitter joins the outermost edges of the two dominating air inlets to underscore the full width of the brawny SQ2 front end. The standard LED headlights and LED rear lights with dynamic turn signals radiate a characteristic, arrow-shaped light signature. Striking details also set accents on the flanks and at the rear. The trim strips in the lower region of the doors are strongly contoured; the exterior mirror housings sport a shining, aluminum-look finish. A long roof edge spoiler provides for sufficient downforce; the diffuser insert houses four exhaust tailpipes. The exterior color palette includes the standard ibis white and the optional colors ara blue, daytona gray, floret silver, glacier white, mythos black, quantum gray and tango red. Audi offers two packages for the SQ2 as alternatives to the standard exterior. With the black styling package, the Singleframe, the air inlet grilles and the diffuser are finished in gloss black. The SQ2 exterior package also applies black styling to the mirror housings, the blade on the C-post and the tailpipe trims. The roof edge spoiler has a special contour, and quattro logos adorn the doors. With a drag coefficient of 0.34, the Audi SQ2 glides easily through the wind. The noise level on-board remains low thanks to the vibration-optimized body and Audi’s high level of competence in aeroacoustics. A structure of hot-shaped steels, which combine extreme strength with low weight, forms the strong backbone of the passenger cell and is responsible for the high rigidity of the entire body. The standard Audi drive select dynamic handling system lets the driver choose between the profiles auto, comfort, dynamic, efficiency and individual. It uses these profiles to manage the character of the steering, the seven-speed S tronic and additional systems. A button allows the driver to set the Electronic Stabilization Control (ESC) to off-road mode. Hold assist is available as an option. The range of wheels available from Audi and Audi Sport offers a choice of ten designs and sizes. 18-inch alloy wheels with size 235/45 tires are standard; 19-inch wheels with size 235/40 tires available as an option (standard with the SQ2 exterior package). The large wheel brakes measure 340 millimeters (13.4 in) in diameter up front and 310 millimeters (12.2 in) in the rear. They are particularly durable, and their calipers – optionally painted red rather than black – have S badges. The compact Audi SQ2 has an exterior length of 4,210 millimeters (13.8 ft) and a wheelbase of 2,594 millimeters (9.7 ft), allowing for a spacious interior. The luggage compartment has a volume of 355 to 1,000 liters (12.5 to 35.3 cu ft) depending on the position of the two or three-way split rear backrests. Standard equipment includes sport seats, a front center armrest, automatic air conditioning, a sport multifunction steering wheel – optionally with paddles for the S tronic – and the driver information system with color display. The optional Audi virtual cockpit replaces the driver information system. The driver controls the fully digital instrument cluster via buttons on the steering wheel. The 12.3-inch display offers three different views, including a screen that places the tachometer front and center. The most important information is also visible in a head-up display, another option. The interior design takes up the progressive, taut lines of the exterior and uses colors and materials to set sporty accents. The headlining, pillars and seat upholstery come standard in black. The decorative inlay on the instrument panel is matt brushed aluminum. The pedal caps and the footrest are made of stainless steel; the illuminated door sill trims up front sport S logos. The instrument dials are gray and the needles white. The MMI monitor and the display in the instrument cluster or Audi virtual cockpit show S-specific start screens when the ignition is switched on. The seats of the Audi SQ2 come standard in a combination of leather and fabric. A leather/ Alcantara mix or fine Nappa leather are optionally available. Accent stripes, contrasting stitching in red and gray, plus embossed S logos round out the range. In addition to black, the fine Nappa leather upholstery is available in two colors (black with red) and with a rhombus pattern. There are two options for the decorative inlay: a red anodized paint finish and the illuminated version “Format light graphics” (with the ten-color ambient lighting package). Other options include air vents with red interior rings and the flat-bottomed steering wheel with shift paddles. The SQ2 interior package bundles these three features: the vents with red rings, the two-color fine Nappa leather seats and the ambient lighting package with illuminated inlay. There are also specific floor mats and a key trim, both with SQ2 logo. As in the Audi Q2, the infotainment range in the SQ2 covers a broad matrix. At the top is the MMI navigation plus with MMI touch. Its menus are clearly structured, and the rotary pushbutton on the center tunnel console includes a touchpad that also enables multi-finger scrolling and zooming. Voice control and MMI search are also fast and reliable. Just a few letters or words are usually enough to get the desired result. The MMI navigation plus has an 8.3-inch display; the data transmission module supports the fast LTE wireless standard and includes a Wi-Fi hotspot for the passengers’ mobile devices. The infotainment range in the Audi SQ2 includes such components as the Audi smartphone interface. It integrates iOS and Android mobile phones with their Apple CarPlay and Android Auto environments into the MMI system. The Bang & Olufsen Sound System features a 705 Watt amplifier driving 14 speakers. Anodized aluminum clasps frame the woofers. LED light guides radiate white light. The driver assistance systems for the Audi SQ2 come from the full-size class. Audi pre sense front is standard and uses radar to recognize hazardous situations that can occur with crossing pedestrians or other vehicles in front of the car. The system warns the driver acoustically and visually, and initiates emergency braking if necessary. This can help to avoid or reduce the severity of a collision. The assist package bundles the most popular optional systems, including adaptive cruise control with stop & go function and the traffic jam assist, which in addition to the radar sensor also uses the front camera. At speeds up to 65 km/h (40.4 mph) on well-developed roads, it can assist with steering, accelerating and braking.